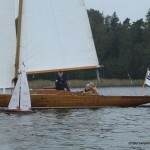 Update: Thanks to Jorma Ojama for sending me some nice pictures from the first six races! 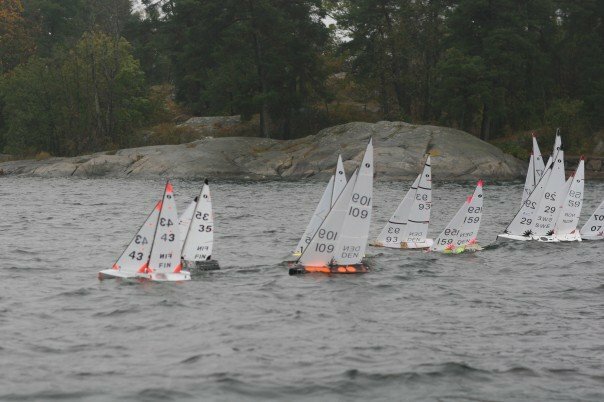 Race 2 of the IOM Nordic Cup (also known as the Scandinavian Cup, although that name is much longer and geographically incorrect) was sailed on 9 Aug 2008 at NJK Björkholmen. 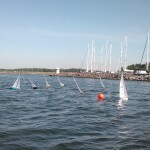 Only ten skippers showed up, probably partly because Helsinki/Finland is far away, but also because our own Finnish ranking series has seen a decline in participants this year (could smaller more readily available boats solve this?). 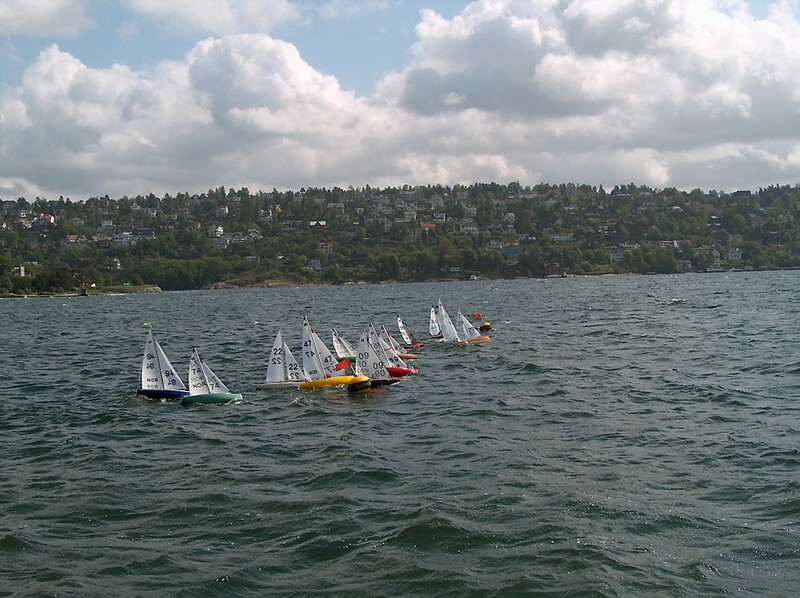 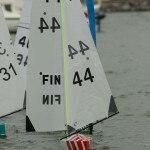 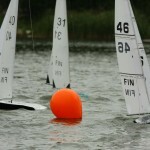 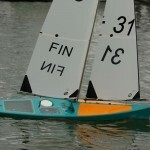 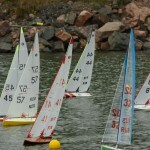 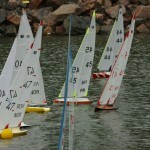 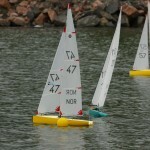 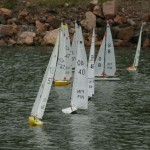 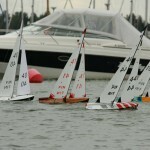 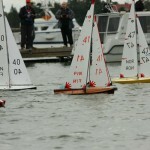 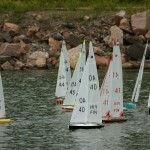 12 races in a shifting westerly wind were completed. 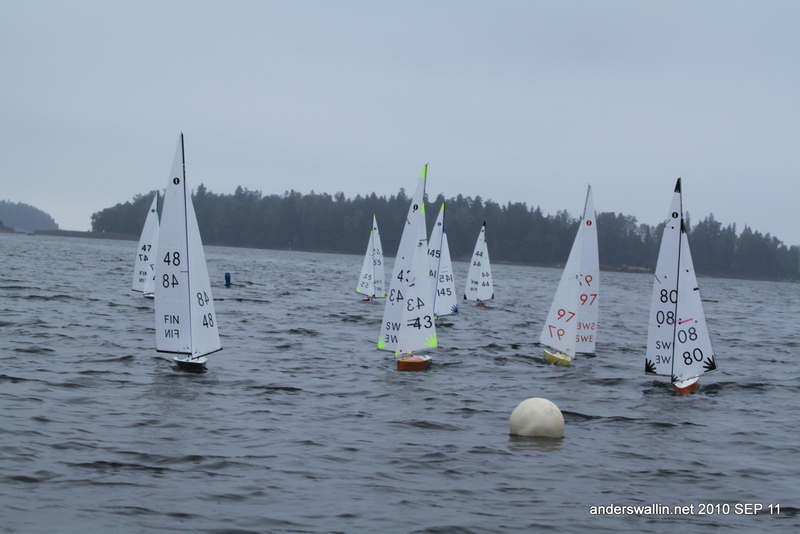 SRSS hosted this year's IOM Nordic Championships in SaltsjÃ¶baden, Stockholm. 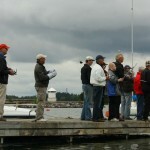 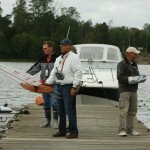 A new record was set when 37 skippers (19 SWE, 10 NOR, 4 DEN, 4 FIN) showed up! 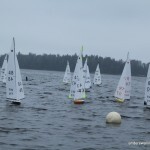 A good thing, since the nordic events are now growing to be even more relevant practice for large championships like Euros and Worlds. 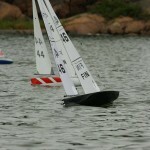 A lot of new boats: Torvald Klem (NOR) sailed a Jeff Byerley Extreme into a comfortable win. 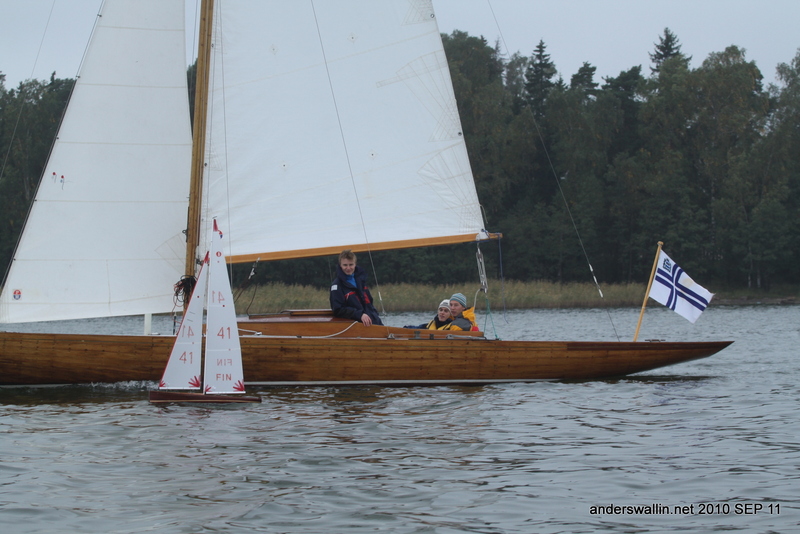 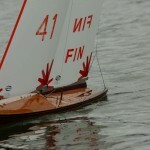 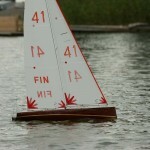 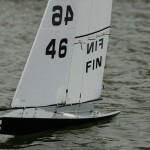 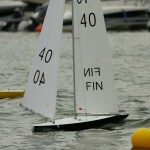 Second place SÃ¶ren Andresen (DEN) has a new wooden boat with modified front sections. 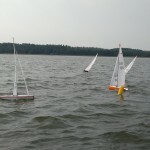 I sailed the new Noux Mk2, but was pushed back from my usual third into fourth place by one J Hellberg (SWE), who with the help of two boats and three discards took third. 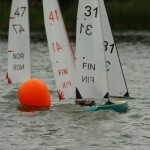 I'm taking comfort in that I had the second lowest throw-outs after Torvald, which in the long run is a Good Thing. 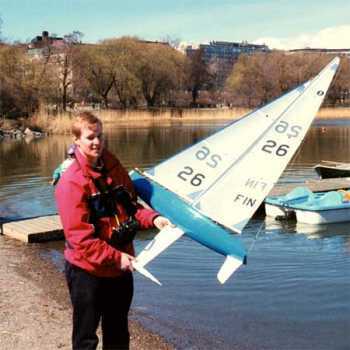 Fifth was Gunnar Karslen with a not-so-new TS-2, showing that the ca. 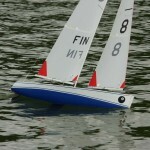 1992 designed TS-2 with original fin and rudder is still a good boat. 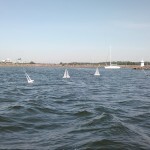 I've now found a mast position on the Noux which results in good balance upwind, but I seemed to loose on the runs. 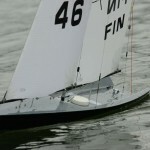 I've done this by moving the mast forward at deck-level, so this also increases aft mast rake. 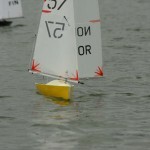 Perhaps I should look for the same balance, but with a more upright mast to balance upwind and downwind speed? 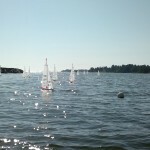 Pictures here, here, and here. 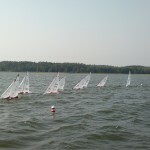 Results from SRSS's site. 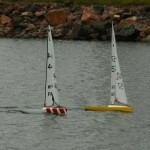 13 skippers (8 FIN, 4 SWE, 1 NOR) competed in race 2 of the Scandinavian Cup 2007 (*) organized by TPS in Turku, Finland during the weekend of 1st and 2nd of September 2007. 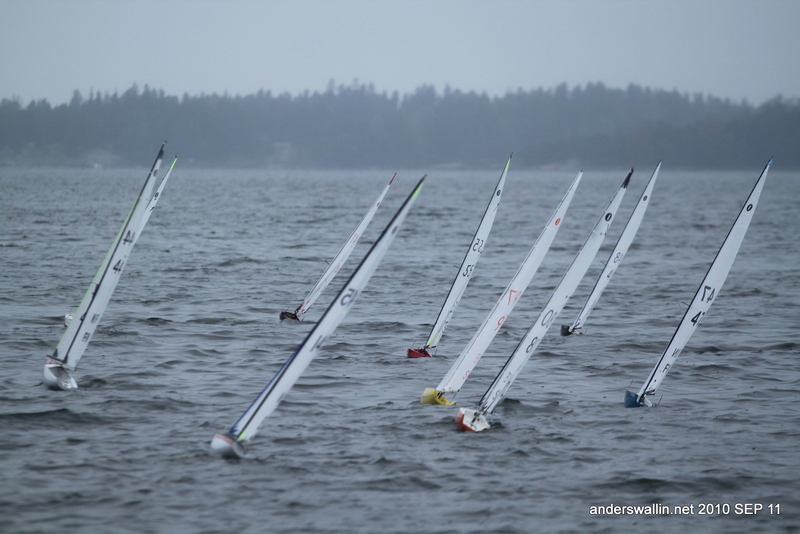 Saturday started dramatically with a thunderstorm interrupting race 1, and most boats changing down to no2 rig for the rest of the day. 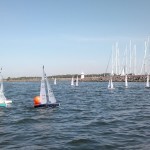 A nice wind direction enabled a long course with skippers being able to walk 1/3 to 1/2 of the course up and down along the pier. 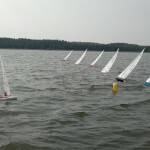 12 races were completed. 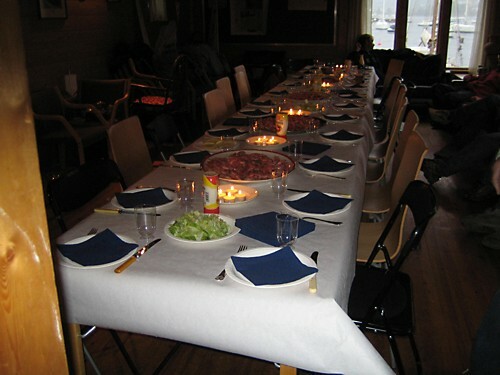 Saturday was completed with an event dinner with our race-officer Harri Korpela as chief chef. 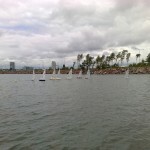 Sunday began with more wind and some risk for rain. 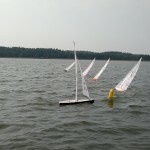 Most skippers started out with no2 rig, but some more or less successful trials were made with no1 rig throughout the day. 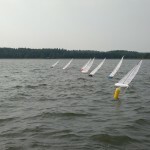 12 races were completed. 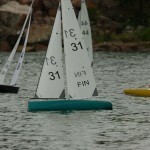 The winner, Torvald Klem from Norway, sailed the most consistently and only let about six heat-wins slip by. 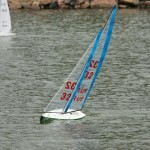 He sailed a new Extreme design from Jeff Byerley/Australia. 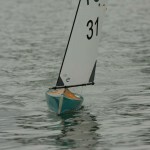 Only the second time in no2-rig conditions for this boat. 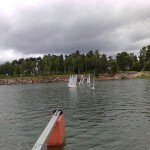 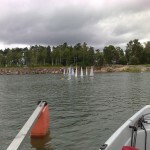 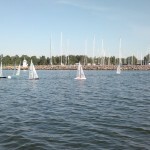 Second place Olle Martonen sails a home-built wood/glassfiber TripleCrown, while third place Timo Syren used a SailsETC Italiko, also taking home the Finnish Class Champion title. 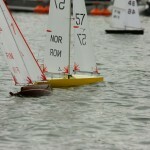 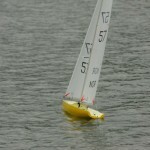 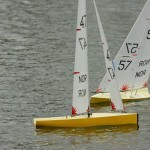 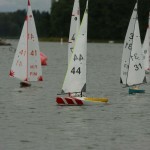 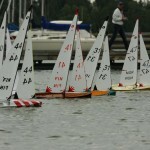 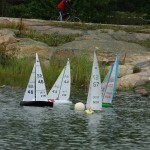 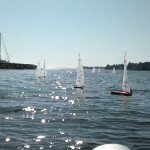 A few new boats were also seen on the race-course. 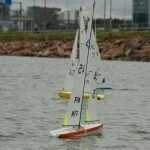 Anders Wallin and Eero Laurila sailed Noux Mk2 designs with still a bit of room for improvement on the trimming and manouverability side. 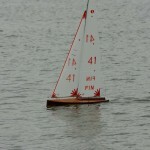 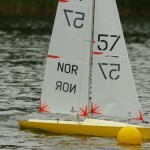 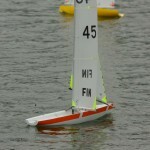 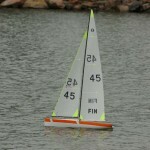 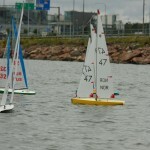 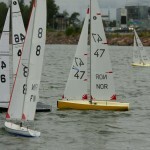 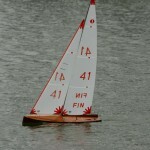 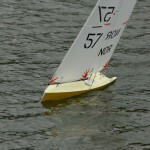 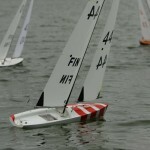 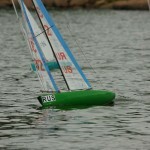 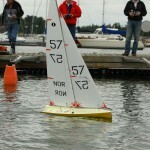 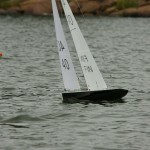 A swedish prototype of the Peter Norlin designed IOM (onemeterfun.se) also competed in its first international event. 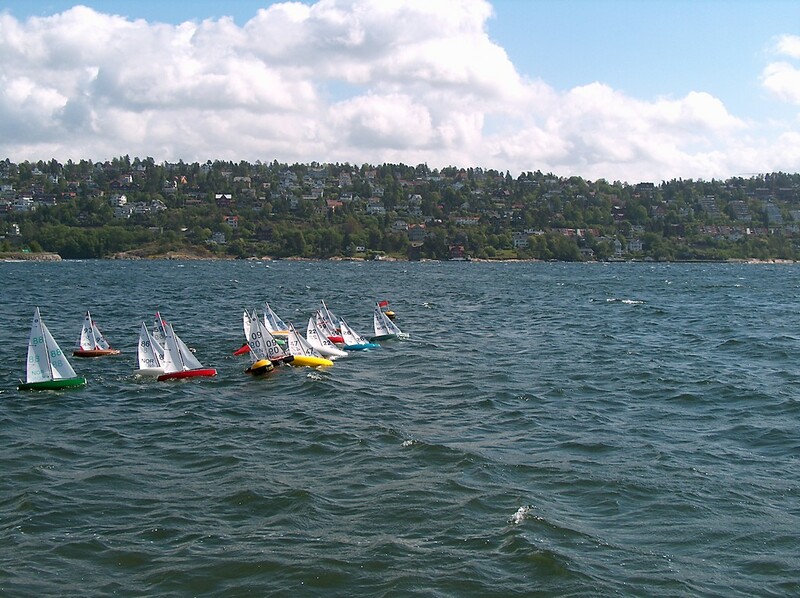 (*) for some good reason these races are now called "Scandinavian", a word that is about double in length, and geographically incorrect, compared to "Nordic". 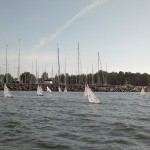 28 skippers from three Nordic countries came together at Malmoya/NMS (wikimapia.org rocks! 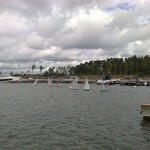 I challenge all my readers to add at least one place!) 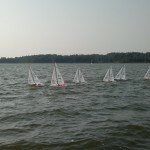 for 8 races on Friday in no2 rig conditions and light rain and continued on Saturday for 6 more races in a strong wind with no3 rig. 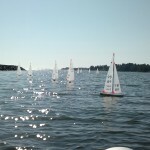 Arriving in Oslo on 17. 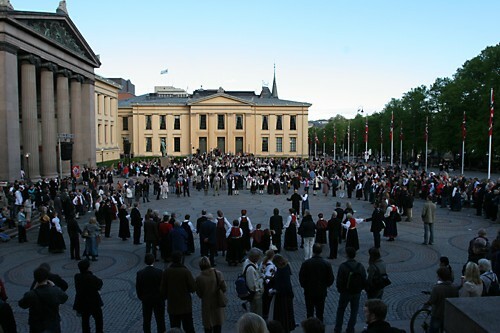 May meant that the whole of Norway was celebrating the constitution day! 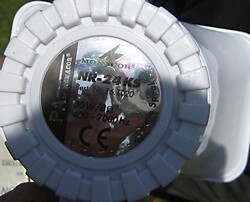 Dancing in the streets. 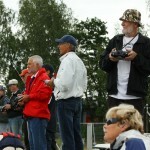 Most people wore traditional Norwegian outfits. 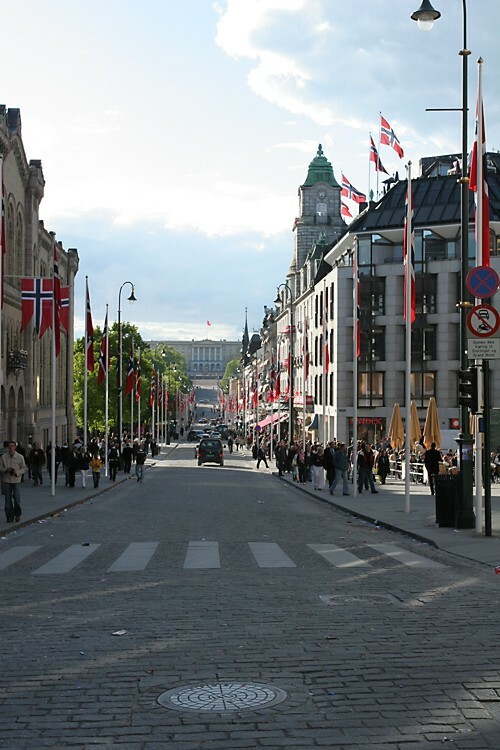 Traffic lights Norwegian style: If one red man is good for you then two must be about 100% better still! 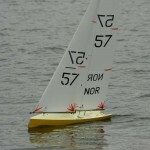 The race was hosted by Norsk Modellseilforening. 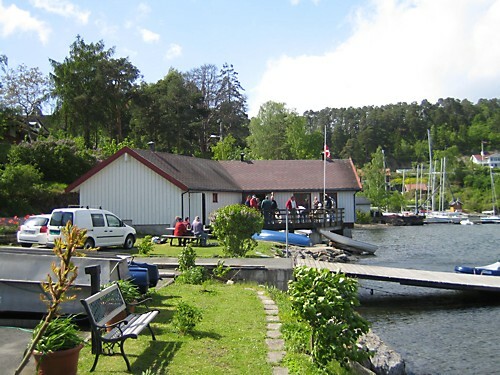 Above their clubhouse on the Malmoya island just 10 minutes outside the centre of Oslo. 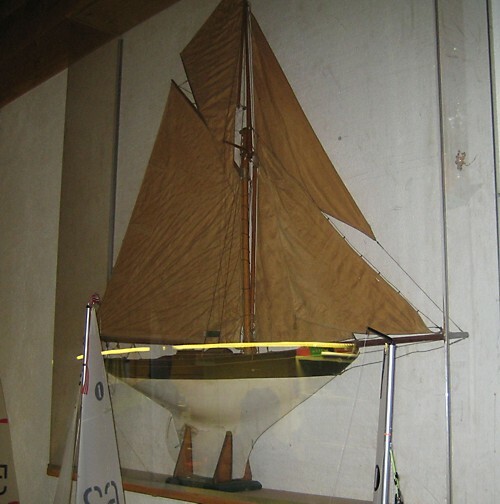 The club was founded in 1904, and it shows in the historic yachts and photographs inside the club. 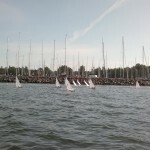 Now they have about 30 members with weekly races gathering 10-15 boats I understand. 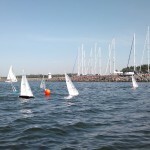 Speed on the second day with the no3 rig was much better and I was able to keep up with the usual suspects that have dominated these races over the past years (that's Torvald K from Norway and SÃ¶ren A from Denmark). 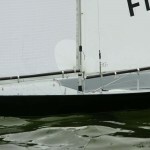 I might be imagining things, but I felt that the Italiko was very easy to manoeuvre and keep still on the starting line, perhaps due to its large area keel. 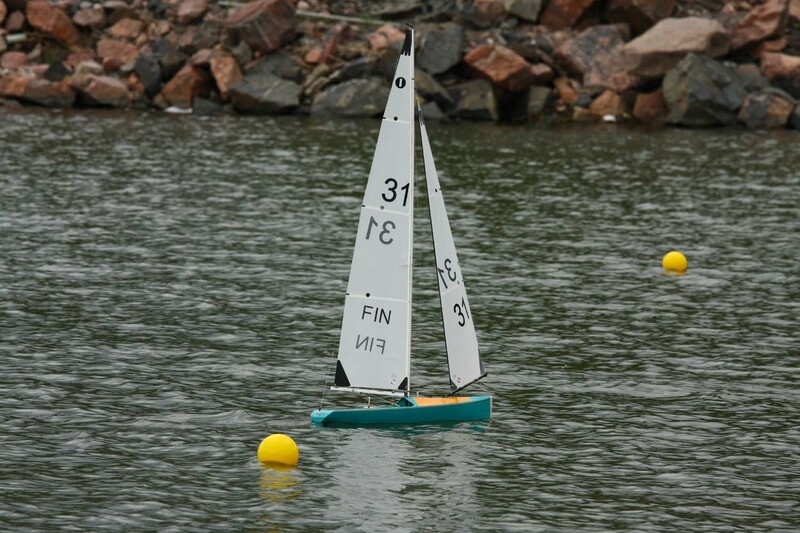 A solid start and a good first rounding is vital in radio-sailing, and as these two bits of the puzzle came together I managed 2-3-2-4-3-4 on the second day (just like the first day should have been!). 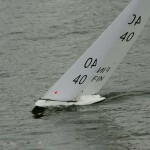 Still there were a boat or two passing me on the long beat because the trim of the boat was not exactly right, but tactically I'm very satisfied with the 2nd day's racing. 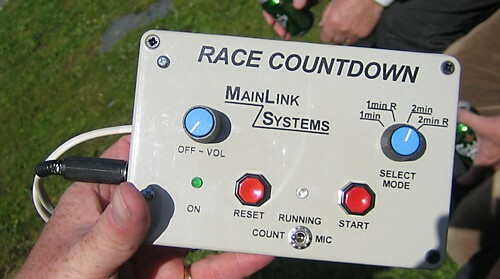 Race officer Ole-Peder BjÃ¶rsom used this countdown system by Main Link Systems together with a speaker (below). 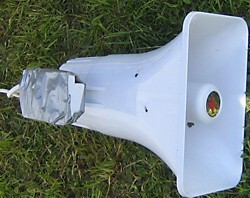 It worked very well and provided enough volume even in the no3-rig conditions. 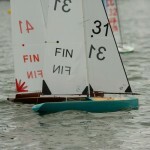 The first day of racing was concluded with a shrimp-based dinner for all participants in the clubhouse. 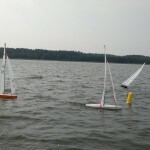 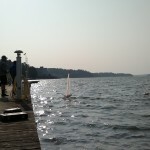 These two pictures were taken just after racing finished on the second day and show the steady 13-15 m/s winds with gusts higher still. 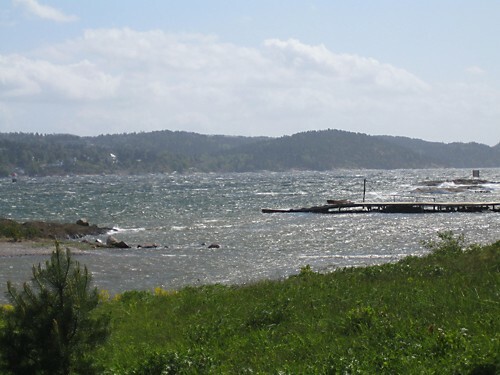 A brave wind-surfer was seen resting for about 10min on the jetty before continuing his blast across the fjord. 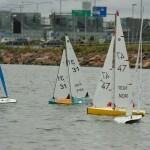 Now it's clear why the Swedes weren't present: they're busy cnc-milling plugs and testing their latest design in the bath-tub! 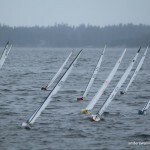 The results and a race report are available at iom-nordic.org. 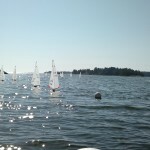 I don't have any sailing pictures, but I'd like to publish some here especially from the 2nd day. 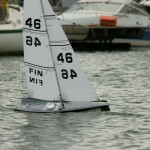 So if anyone has some good action photos let me know. 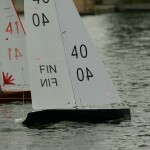 If you look real hard behind the bow/jib of NOR-59 you can see a bit of blue - that's me! 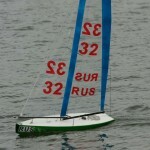 This is probably not the same start as the one above. 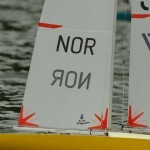 Note however how the (consistent?) 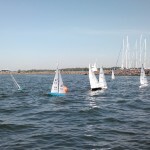 skippers prefer a similar position on the line. 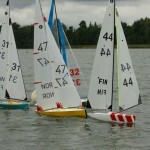 The yellow (47) and black (09) boats are close to the starboard flag, the red (59) and blue (26) are in the middle of the line. 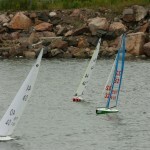 Nothing new under the sun when it comes to the results, Torvald Klem won, 2 points in front of SÃ¶ren Andresen, and myself third, 2 points after SÃ¶ren. 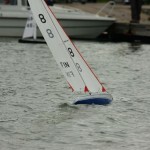 No pictures from this event as Saturday was too wet for photography and I tried my best to concetrate on the sailing on Sunday... 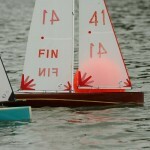 If anyone has photos, please send me them and I'll gladly post them! 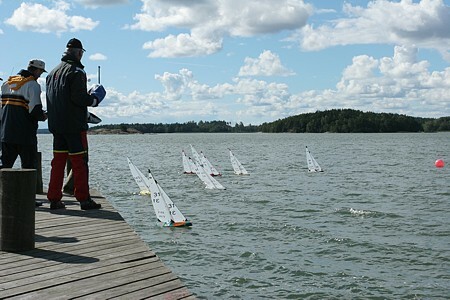 Results and pictures are likely to appear on www.iom-nordic.org in a few days. 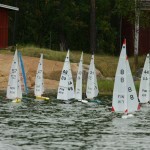 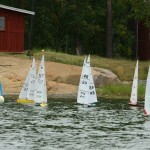 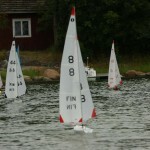 The second Nordic Cup event of the season was held on 19-20 August in Herslev near Roskilde in Denmark.